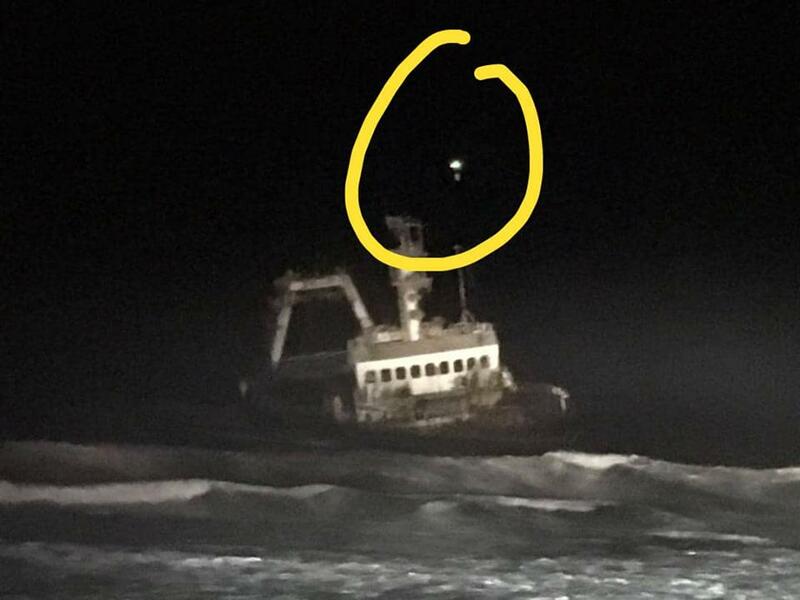 Pictured: Circled in yellow is the elderly man stuck on the deck of the Zeila and the little drone that played a vital role in the eventual rescue of the man on Saturday morning. People and emergency vehicles gathered at the site for the entire Friday night to assist the man and rescue swimmers on board. Photos courtesy of Leon Krause and Brian Low of Life link Emergency Rescue Services. 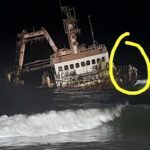 Dramatic scenes played out during a rescue effort of an elderly man stuck on board the well-known stranded wreck of the Zeila near Jakkalsputz off the Skeleton Coast of Namibian on Friday night. 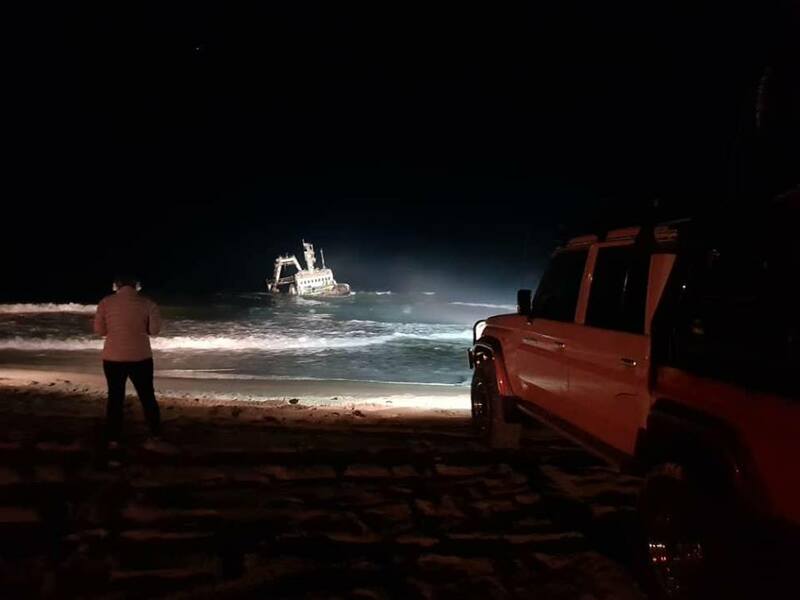 Members of the Henties Bay Fire and Rescue Service supported by volunteers had to wait for low tide and sunlight on Saturday morning to eventually rescue the victim from the wreck after he was stuck there exposed to the elements the entire night. 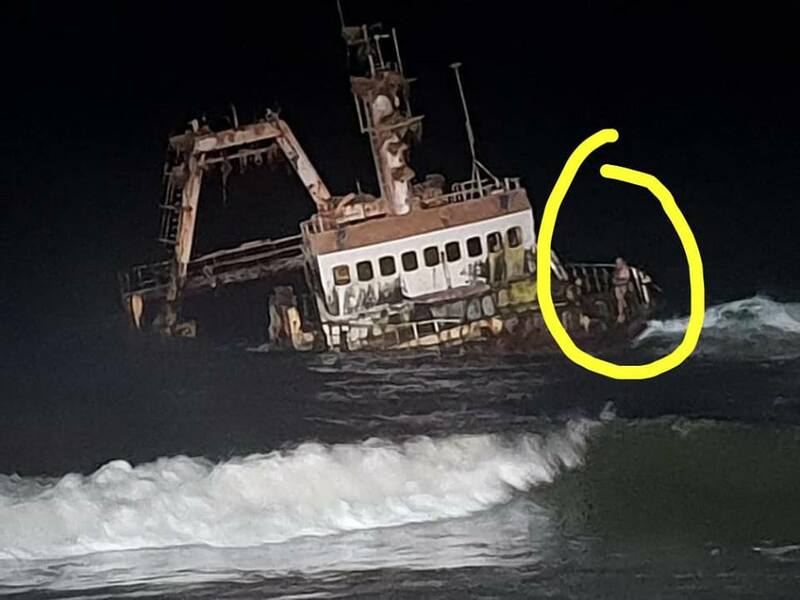 According to Brian Low of Life link Emergency Rescue Services, the 68-year-old man from Swakopmund stopped off at the wreck which has became a tourist attraction since it got stranded on the desolate beach in the Namib Desert with his family and decided to swim to the wreck. He said the incoming tide and the setting sun made it impossible for him to swim back to land and his worried family decided to call the emergency services to affect a rescue. Low said numerous members of the public volunteered their assistance. In the end a fisherman returning from an angling trip on a beach nearby used a small quad copter drone to ferry emergency blankets and messages out to the people on the wreck about a hundred metres offshore. The drone pilot and his quad copter also attempted to ferry fishing line attached to a heavy rope to the men on board. Another person involved with the rescue attempt, John Jones, said the little drone and the pilot were the real heroes of the drama. The rescue team also requested well-known resident and surf fisherman of Henties Bay to go to the scene and bring along his championship rods and reels. The idea was for him to cast a light weight fishing line onto the wreck. The light weight line was attached to a heavier rope and the men on board the stranded wreck was supposed to use the fishing line to pull the line on board and use it to get to shore. Low said paramedics from LifeLink on the scene of the drama checked the man’s vital signs because they feared that he might have become hypothermic. He said the man was cleared and after getting dressed, he got back into the vehicle he and his family arrived in and drove back to Swakopmund.